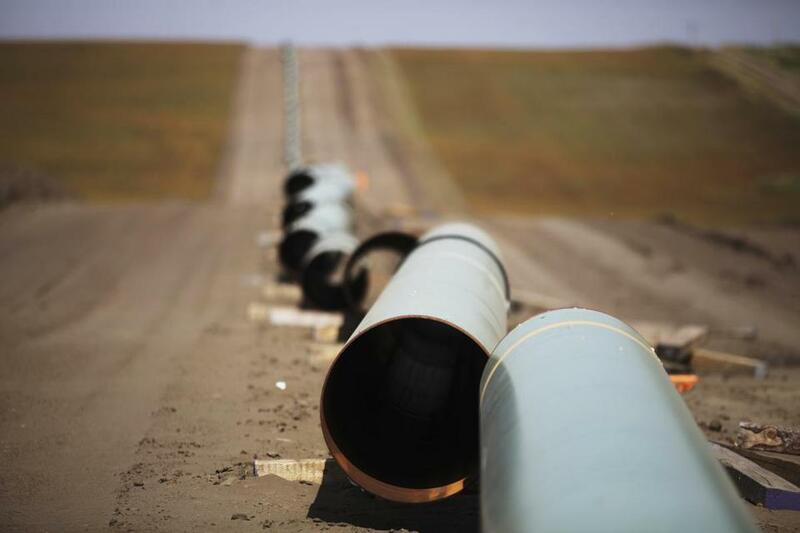 A gas pipeline under construction in Belfield, N.D. According to the March 4 editorial “Gas-by-train? Call your senator,” meddling politicians — the attorney general and the state Senate — blocked new natural gas pipelines. In fact, natural gas pipeline companies themselves will not build pipelines without first securing guaranteed purchasers and long-term contracts for gas. At the same time, owners of natural gas-fired power plants will not enter into long-term contracts for gas because they can almost always buy it on the spot market for less than these contracts. These generators are also watching the spectacular descent of solar and wind prices and hedging their bets. Because neither side is willing to take on the financial risk — unless it is somehow subsidized — few major pipeline expansions go forward. This raises the question: If building a major new gas pipeline has such compelling economics, wouldn’t these companies find a way to resolve the obstacles associated with the financial risk of building them? Instead, the pro-pipeline folks started to look for other ways to pay for them. They focused on methods that shield the pipeline companies and the power generators from exposure to financial risk. Their idea was as unimaginative as it was unfair: Change the law to force the ratepayers to pay for pipelines and shoulder the associated financial risks. The Massachusetts Supreme Judicial Court rejected this concept in 2016, saying it was contrary to the Electric Industry Restructuring Act of 1997. The court specifically held that ratepayers cannot be at risk for this type of infrastructure investment. It is great to see the Globe recognize that “renewable energy is certainly the region’s future” and “Massachusetts needs more clean energy.” The Environmental League of Massachusetts could not agree more. This is why we are seeking the expansion of the state’s energy efficiency policies and renewable energy supply. We need continued investments in a modern power system fueled by clean, job-creating resources such as wind, solar, and storage. While the cost of natural gas is currently low, if we start exporting it abroad, the costs may rise. Meanwhile, in the last eight years, the costs of onshore wind have fallen 67 percent and utility-scale solar costs have dropped 86 percent, with more declines to come. The Boston Globe’s March 4 editorial arguing for new natural gas pipelines was wrongheaded. Watching the ocean pour into our neighborhoods this month was a vivid reminder that global warming and sea level rise already threaten our homes and families. Natural gas is a major source of global warming emissions because of massive methane leaks from drilling sites, and building pipeline infrastructure is an endorsement of more fracking and more fossil fuel use, now and in the future. The answer is not, as the editorial puts it, for our state to sit around “awaiting its clean energy future.” Rather, we must aggressively invest in clean energy right now. This means deploying renewable energy sources such as solar panels and offshore wind turbines and replacing natural gas heating with modern electric systems such as air-source heat pumps. If we want to do all we can to protect our communities, we don’t have time to waste. The writer is a policy analyst with Frontier Group. The Globe editorial page does not grapple with the long-term nature of energy markets in its recent pro-pipeline editorials. Firm pipeline contracts are at least 20 years long, so the question is not about the marginal emissions from transporting gas today, but rather about how much more methane would be burned over a pipeline’s decades-long lifetime. Attorney General Maura Healey answered this question in her study that found it is better to spend billions on cleaner, less-expensive alternatives than to invest in gas pipelines. It is neither purist nor NIMBY to follow these findings to their logical conclusion that new pipelines are a harmful use of ratepayer money. The fact is that Massachusetts’ total gas use needs to begin going down, not up. Subsidizing gas capacity expansion would not allow the state to meet its emissions reduction mandates. I am glad to hear the editorial board discuss the important topic of transportation sector emissions. Cars burn far more oil than power plants. I look forward to hearing more about transportation carbon pollution economy-wide, not just when shipping fossil fuels.